The exhibition Berlin Projects. Architectural Drawings 1920–1990 delves into an exciting period in the urban and architectural development of Berlin. The exhibition Berlin Projects. Architectural Drawings 1920–1990 delves into an exciting period in the urban and architectural development of Berlin as rendered by Hans Scharoun, Hans Poelzig, Frei Otto, Gottfried Böhm, Zaha Hadid, Álvaro Siza Vieira and other famous architects whose drawings are part of the collection of the Deutsches Architekturmuseum in Frankfurt am Main. 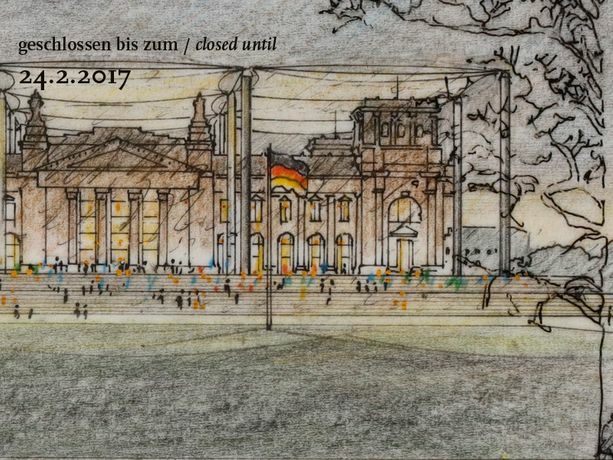 The Reichstag plays a central role in the show represented by Gottfried Böhm’s studies, drawings by Helmut Jacoby for Lord Norman Foster and the project for a wrapped Reichstag by Christo. The exhibition also focuses on visions generated for the capital in the early 1990s for the competition ‘Berlin morgen’ (Berlin Tomorrow) organised by Vittorio Magnago Lampugnani and the Deutsches Architekturmuseum. Many renowned architects participated, including Bernard Tschumi, Mario Bellini and Manuel de Solà-Morales whose works feature here.